The following are excerpts from actual reviews on 1000Bulbs.com. What do they have in common? They're all from reviews of 130 Volt light bulbs. “...even though the watt ratings are the same... the new ones aren't as bright as the old ones." "The low output also makes the color of the light very yellow..."
"...for 300 watts I thought it would be brighter." These customers, and several others, have a fundamental misunderstanding of 130 Volt light bulbs. That's not their fault, however; it's ours. So let me try to clear up this issue once and for all. As discussed briefly in an earlier article, the short, technical version goes like this: 130 Volt Halogen and incandescent light bulbs are manufactured with a thick filament designed to withstand a theoretical 130 Volts. I say "theoretical" because almost all homes in the US operate on only 110-120 Volts. The thicker filament in a 130 Volt bulb, when operated on typical 110-120 line voltage, has a higher resistance to the electrical current flowing through the filament, decreasing the amount current across the filament. As a result, the bulb burns cooler, uses less energy (watts), and lasts longer; however, as a trade-off, the bulb is also slightly dimmer and has a lower (more yellow) color temperature. Understanding Voltage, Amps & Watts: "Hose Theory"
To understand this phenomenon, an analogy is useful. Think of a garden hose. When you turn on the tap to just a trickle, water flows freely through the hose without resistance. As you turn the tap more, you force a larger volume of water through the hose, which is met by a small amount of resistance from the hose. Now turn the tap to its highest setting. Instead of trickling from the end of the hose, water now sprays across your lawn and into the leather interior of your neighbor's new convertible. Because the hose is relatively small, it provides a lot of resistance to the more voluminous water flow, which causes pressure to build inside the hose. The increased pressure in the hose propels the water several feet instead of flowing with the mere trickle you saw when you had the tap at a lower setting. To take this concept further, imagine you continued to increase the volume of water flowing through the hose by attaching it to a fire hydrant (assuming such a thing was possible). At that point, the water pressure would become so intense it would weaken the hose, eventually causing it to rupture. Maybe that's a dramatic example, but the thin tungsten filament of a light bulb is not unlike a water hose. In the case of electricity, however, the volume of water is electrical current and the water pressure is voltage. With a 60-Watt light bulb, for example, you are forcing 0.5 amp of electrical current (the "water") through the filament (the "hose") with 120 Volts of pressure. The current meets the resistance of the filament, causing the filament to become hot and glow. Over time, just as with the water hose, this stress will cause the filament to break, making the bulb "burn out." To prolong the life of the bulb, you could lower the volume (amps) or the pressure (voltage). This is the approach taken by old rheostat dimmers. However, you could also use a bulb with a thicker filament (a bigger hose), that places less resistance on the current so that it flows more easily. This method, as stated before, is the approach taken by the 130 Volt bulb. Because the current moving through the thicker filament meets less resistance, it requires less energy to produce light. The more freely moving current also does not make the filament as hot so that the color temperature of the light is also lower. As the table to the right shows (from Jack L. Lindsey's Applied Illumination Engineering), the trade-off is a very good one, too. A very small decrease in voltage and lumens leads to a huge increase in life and a considerable decrease in energy usage (watts). Lowering the voltage only 8%, for example, leads to a 300% increase in life and nearly 15% decrease in energy usage with only a 25% loss in light output! Now back to the original question: Why buy 130 Volt light bulbs? The answer is simple. 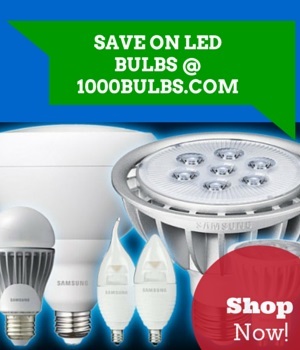 Buy 130 Volt bulbs when you want to save energy, change your bulbs less often, and don't mind slightly lower light output and warmer color temperature. Have more questions about 130 Volt light bulbs? Ask us in a comment below or connect with us on our Facebook, Twitter, Google Plus, LinkedIn, or Pinterest pages. Edit 2015-03-02: Amended error where it stated that a 130V bulb has a lower resistance. The resistance is higher, while the current is lower, decreasing wattage used.